Provided below are 2010 recycling tonnage reports provided by individual recycling markets as well as the MCMUA. These reports are useful for municipal recycling coordinators while completing their annual recycling tonnage reporting forms. * Please note that aluminum, plastic bottles, glass, and tin/steel appear as CMG (commingled). Also, MIX consists of various types of paper. The percentages for these categories are listed below. MCMUA 2010 Scrap Metal Recycling by Town - (PDF File) - This report shows shows scrap metal recovered at the Mount Olive transfer station. Scrap metal was recycled at George's Salvage of Newton, NJ. MCMUA 2010 Tire Recycling by Town - (PDF File) - This report shows tires that were collected by the Morris County Mosquito Extermination Commission (these tires had been illegally dumped in a variety of municipalities), generated by the Morris County Motor Services Center and/or accepted from individuals at the MCMUA's Parsippany transfer station. All tires accepted at the transfer stations were shipped to and recycled at Casings, Inc., Hillsboro, NJ. 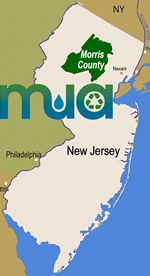 The tires generated by the Morris County Motor Services Center were shipped directly to and recycled at Rubbercycle in Lakewood, NJ. MCMUA 2010 Recycling by the Vegetative Waste Recycling/Compost Facilities - (PDF File) - This report shows the vegetative waste recycled at the MCMUA's two vegetative waste recycling/compost facilities located in Mount Olive and Parsippany-Troy Hills Townships. Lake weed listed in the report can be reported as grass for recycling tonnage grant purposes. 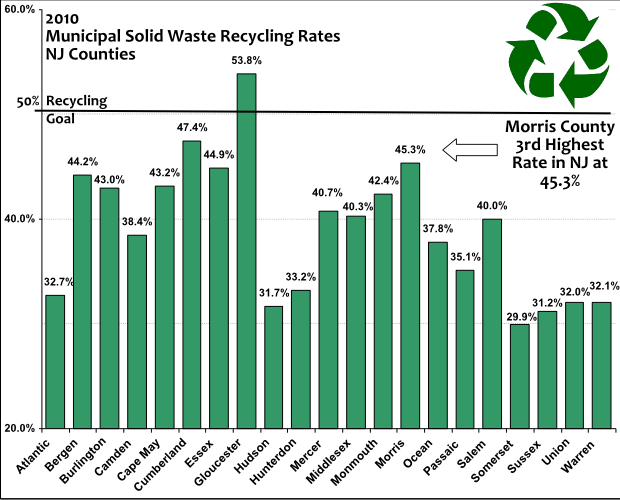 MCMUA 2010 Recycling by the Household Hazardous Waste Programs - (PDF File) - This report shows the materials recycled as part of the MCMUA's household hazardous waste program both from the permanent facility as well as the individual disposal days. This does not include bulbs and batteries accepted as universal wastes at the MCMUA's Recycling Consolidations Center. Those figures are included in the first report for the Recycling Consolidations Center. American Recycling Technologies - PDF File - This report shows the number of pounds of textiles recycled by municipality by American Recycling Technologies. Back-To-The-Future - PDF File - This report was provided directly to municipalities by the market. Cintas Document Management, Bridgewater, NJ - Excel File - As a document destruction company, not a recycler, there is no guarantee of the quality of paper, but Cintas has an exclusive agreement with a national paper manufacturer to take its shredded paper for recycling. Clayton Block, Inc. - PDF File (Clayton Belmar) - PDF File (Clayton Edison) - Two tonnage reports of the asphalt, concrete, asphalt roofing, brick and block recycling Clayton Block reported for Morris County customers for 2010. These PDFs contain recycling reports for 2 different Clayton facilities including the Edison and Belmar facilities. Colgate Paper Stock - PDF File - Reports are obtained from their website using the instruction provided in this PDF File and registering on their website to view reports. Interstate Battery - PDF File - This report is listed by zip code. Please check the entire report to determine which, if any of the entries belong to your municipality. The information is listed in pounds, please be sure to convert to tons. If you have any questions, please call Brinda Kastro, office manager, at 973-334-0132. Safe Shredding - PDF File providing the pounds of shredded mixed paper recycled from Morris County generators in 2010. Be sure to check under all possible location names in this report as it sorted by common location names (i.e. Flanders, Whippany, Stirling, etc.) and/or zip codes and not necessarily the official name of the municipality (i.e. Mount Olive, Hanover, Long Hill). Shred-It, Newark, NJ - PDF File - This report provides 2010 paper recycling tonnage by municipality. The material is recycled at a paper mill in Wisconsin. Call 973.244.7473 for more information on this report. Safety Kleen - PDF File (sorted by customer name) and PDF File (sorted by municipality). The Safety-Kleen report for Morris County is listed in two reports. Please check every page of the reports and determine which businesses are located in your municipality. The reports are listed by city and customer/business name and zip code. From those lists, each municipality needs to determine, which businesses, if any, are actually located in their municipality. This report is listed in tons. Please note that if there was no material brought to or picked up by this vendor, you will not see your city and zip code listed.